Intense, solar-powered space lasers could someday shine a focused beam on huge lightweight sails, allowing a spacecraft to reach enormous speeds and resulting in practical interstellar flight. An engineering model of the Cosmos 1 spacecraft at NPO Lavochkin in Moscow. The model is constructed mostly of actual spacecraft components, though without many of the electronic parts. The green cylindrical parts that resemble sleeping bags are packaged Mylar sails that will unfold when the spacecraft is in orbit. The S-310 rocket which was launched from Uchinoura Space Center at 15:15 of August 9, 2004, by ISAS. It carried two kinds of deploying schemes of films with 7.5 micrometers thickness. A clover type deployment was started at 100 seconds after liftoff at 122 km altitude, and a fan type deployment was started at 169 km altitude at 230 seconds after liftoff, following the jettison of clover type system. Both experiments of two types deployment were successful, and the rocket splashed on the sea at about 400 seconds after liftoff. Les Johnson, of Marshall Space Flight Center, holds a rigid, lightweight carbon fiber material that may be used to build a giant space sail. While solar sails have been designed before, materials available until recently were much too heavy to design a practical solar sailing vehicle. This new sail type is promising because it would be made out of lightweight carbon fibers only a few microns thick. In fact, a solar sail used for space travel would need to be almost as thin as a piece of notebook paper. This carbon fiber material is stiff and can withstand the intense heat from the sun, while capturing the sun's energy. 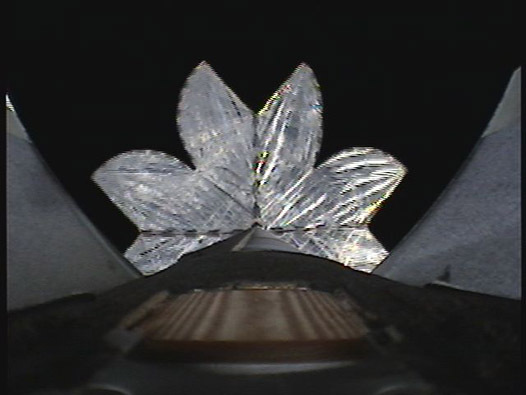 This means a solar sail could fly closer to the sun to capture even more thrust from sunlight.